True champions never quit. 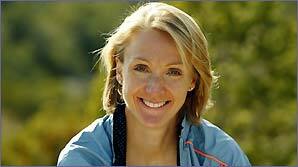 And that is what Paula Radcliffe proved today in New York’s Central Park. After the turmoil she had gone through at Athens, she finally had a chance to show the world once again that she is a true champion. There is no other athletic event that is as exciting as a closely fought Marathon. We did not had a chance to see the famouse front-running style that Paula is normally associated with. But at the end she just proved that she had it in her to sprint through the final 300 metres. The Kenyan Chepkemei tried to take a lead a lot of times but Paula never allowed the Kenyan to settle down and was always pushing. She was much slower than her personal best of 2:15:25, a world record that she set up in London last year. But that did not matter as she managed to overcome the tough conditions and emerge triumphant. Congrads Paula for winning the New York Marathon.